Tom Daley is celebrated his victory at the Diving World Championships in Russia – after picking up two medals. The British Olympic diver headed to Kazan, Russia for the World Championships this week – where he competed in the men’s 10m platform event. The out diver headed to Russia despite the country’s anti-gay laws, which bans all ‘propaganda of non-traditional sexual orientations’. He recovered from the a difficult start – trailing in ninth place after two rounds – to cement a position in the top three. 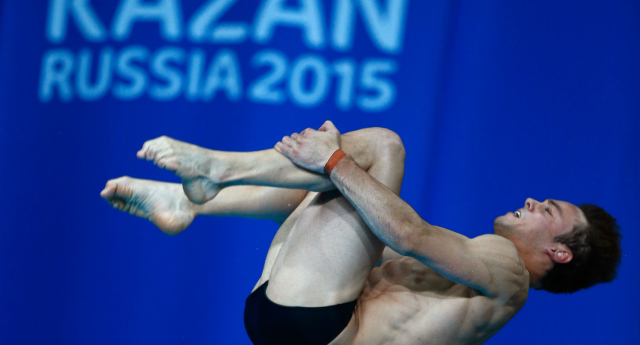 The diver had already secured a place for Team GB at the Olympics by qualifying for the final – but earned a firm position on the podium with a total score of 537.95. He picked up a bronze medal at the event, celebrating with his coach Jane Figueiredo. It was his second medal of the event – picking up a gold medal in the mixed team event last week, alongside diving partner Rebecca Gallantree. Speaking to PinkNews last month, Daley weighed in on rumours he would be stepping away from the sport after the Olympics next year. He said: “I’m definitely going to take a little bit of time off – after four years, that’s a long slog. Is Tom Daley about to do I’m A Celebrity?